Looking forward to getting started on this challenge! Already seeing some good-looking images beginning to shape up. I do have one question about the rules which I’m hoping to clear up before I start posting. In the guidelines, it says not to post any images or videos from the film or they will be removed. I was hoping to use a reference image to post along with my renders which I’ve noticed a couple people doing. Is this OK? Basically, that rule was made because I don’t want anyone posting illegal screencaptures or videos. If you find an image from a reputable source, you can definitely post it along with your image. This is my second advance of the challenge. Este es mi segundo avance del challenge. kvdo: Welcome, great start! You’re really starting to capture the feel of the reference image. One major quality that the reference image has and I’d like to see in your image is more saturated/warmer shadows. The simplest way you could achieve this is by adjusting the curves in post processing. Overall your image looks much more yellow/gold overall and could use more reds. But, if you manipulate the curves, I think you’ll be able to pull out those reds into the darker areas. If you take a look at the vents and poles attached to the vents in the reference they are much darker. The top of the walls could go much darker. The black metal on the stoves could use less reflectivity and more fresnel reflection. You should barely see the floor in the reflection of the stove in the back center of the image. This is looking great, I’m really looking forward to more! Once you make those decisions you can then begin to build up your lighting. Keep at it! 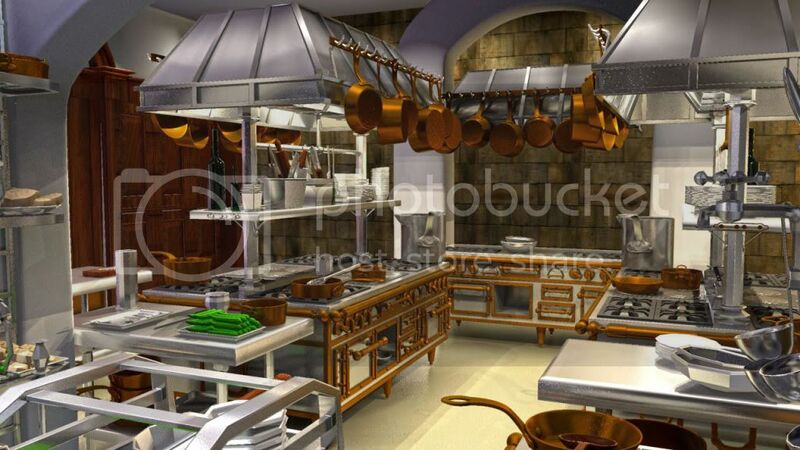 This is the first Image posted for Kitchen Render Just a Kick Start. I am using Maya Mental Ray and FG. Your Critics and Comments most welcome. as It would really Help me to make some good render. Is anyone using VRay for Maya? I’m trying to render out an image and as soon as I turn viewport subdivisions on, it takes for ever, any idea what could be causing this? asinn: You’re welcome to ask any questions related to this challenge here. If you have unrelated questions to the challenge, the Lighting and Shaders forum would be better for you to get responses. harshaldeorey: Good start! The brass objects in the scene are looking a little dark. Make sure they have almost no diffuse and very high reflectivity. I’d like to see some more focus to the lights in the scene. Try to have a few brighter areas where you want the attention to be. I’d also like to see some more shadow areas, you have the brights and mids but not much or darks. Keep at it! Thanks for the feedback kanooshka! I’ve worked a bit more on getting some reds into my shadows, and reddening up the image in 3D. I’ve also made some curve adjustments in post. I’ve also worked on reflections and shadows as suggested. Is it necessary to improve on some of the materials? Any other thoughts? Hello all, I am happy to start this new great challenge. I like the idea of refering to a pixar picture. here is my reference and my first post. I’m not contributing here but just wanted to say that there’s some really great lighting and shading here, awesome work! Hello all. I am happy to start this great new challenge. I like the idea to refer to an pixar’s picture. hi i live in Iran .and i really would love to participate in this challenge, unfortunatlly due to the intesive filtering in my country i cant download the modeling files , i need the max one , any body could be so kind to post the file to my email? how do i post an image? i want to participate in this challenge. please let me know your opinions. if this has been posted multiple times, i am sorry, i am still learning the technique of posting images. Did you lower the Max Subdivs parameter, which is set to an insane value of 256 by default when activating viewport subdivs. Another update. Replaced most spots by IES lights. 24 lights in all, no GI. Rendertime jumped to 24 min, mainly because of the material changes I think. Removed the window for now, plan is to add back a larger arched window. Still lots to work on to get closer to the movie color palette. This first image straight from Modo. Some amazing renders out here. Kudos to everyone. I really love the enthusiasm. I love the updated render from Kevin van den Oever. Looks simply fantastic. I love how you have blurred the pan in foreground. The gas stove is going a little too dark and the copper might be going a little too red. Except that, brilliant work! More darkening on the wall above the shelf.